Italy Convicts 2 Men For Shipwreck That Killed Some 700 Migrants : The Two-Way A Sicily court has convicted the ship's captain and another man over the wreck involving hundreds of migrants in April 2015. It was one of the deadliest migrant disasters in the Mediterranean. 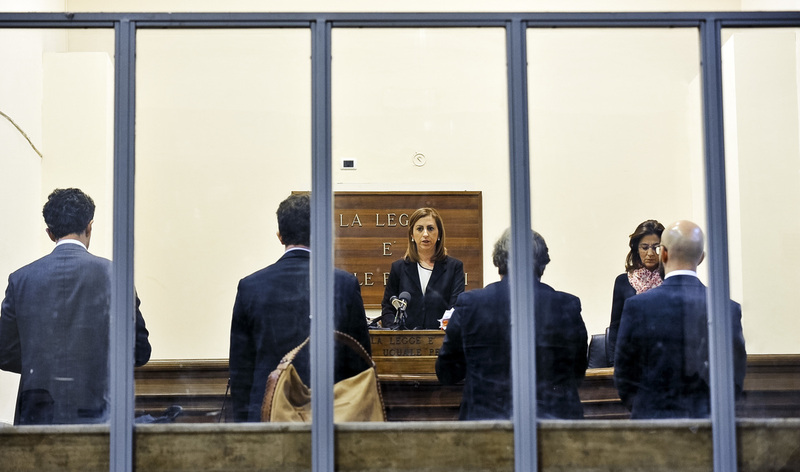 Judge Daniela Monaco Crea reads the sentence on Tuesday in the trial against ship captain Mohammed Ali Malek and crewmate Mahmud Bikhit in the April 2015 shipwreck off Libya that killed 700 people. A court in Sicily has convicted two men over the sinking of a ship carrying hundreds of migrants in the Mediterranean in April 2015. Some 700 people died in the wreck, making it one of the deadliest ever migrant disasters. The deaths prompted calls in Europe to take the migration crisis more seriously. Now, a judge in Sicily found Tunisian Mohammed Ali Malek guilty of manslaughter and sentenced him to 18 years in prison, NPR's Sylvia Poggioli tells our Newscast unit, adding that Malek was accused of captaining the doomed ship. She adds: "Malek denied he was the boat's captain, saying he had paid for passage like everyone else. But survivors' accounts indicated that he was the man in charge." The court also handed a five-year sentence to a Syrian man named Mahmud Bikhit, who was identified as a cabin boy, as Sylvia reports. The men were also each fined $9.5 million, Reuters says. They plan to appeal. Prosecutor Carmelo Zuccaro said the verdict "reinforced two important legal principles: affirming Italian jurisdiction for illegal immigration cases that occur in international waters, and considering rescued migrants as victims, not suspects," according to The Associated Press. "Once the fishing boat hit international waters, Malek called the Italian coastguard in Rome, which in turn sought the help of the King Jacob, a Portuguese container ship sailing nearby. While the container ship's captain told prosecutors that he sought to avoid a collision, witnesses said that Malek began to steer his boat toward the enormous ship, slamming it into the side of the large vessel. Passengers began to panic and the fishing boat capsized. It then sank within minutes." Earlier this year, the Italian government brought the wrecked ship up to the surface "in an effort to identify the dead and give them a decent burial," Sylvia adds. This particular migration route has only grown more deadly since the 2015 wreck. 2016 has been the deadliest year ever for refugees and migrants crossing the Mediterranean, according to the U.N. The International Organization for Migration has documented 4,742 deaths in the Mediterranean since the beginning of this year.